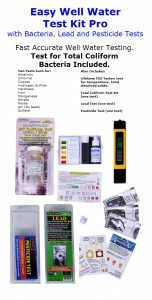 The maximum contaminant level (MCL) for iron set by USEPA standards is 0.3 ppm, also referred to as 0.3 milligrams per liter of water. 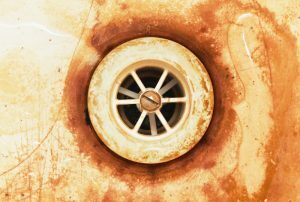 In concentrations above 0.3 ppm, iron in water can cause staining of fixtures and porcelain, and ruin laundry. A bittersweet astringent taste is detectable at concentrations above 0.5 ppm by many people. Manganese is often found with iron, and causes brown, black and/or tea-colored staining, and imparts asphaltic and oily tastes, above .05 ppm. Some of the same filters used for iron, are used for manganese removal. Iron and manganese are often found in a dissolved state in well waters, and the water appears clear when first drawn. Upon exposure to air, or after the addition of oxidants (such as chlorine bleach or ozone), this ferrous iron is oxidized (“rusted”) to the ferric state to form insoluble particles. The water then looks orange or yellow, or in the case with manganese, brown or black. This can happen in toilet flush tanks and in the washing machine or dishwasher. If sulfur odor is present along with iron, typically chlorine or ozone is fed ahead of an iron filter. For water very high in iron with high levels of hydrogen sulfide and/or manganese, and/or iron bacteria, we recommend a pre-chlorination feed for maximum removal rates. 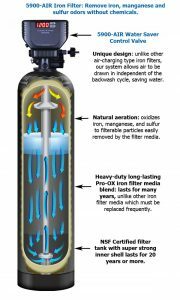 After the iron filter, many folks will use a carbon filter to remove any trace of the chlorine taste or odor. The role of pH is very important in iron treatment. Generally, if the pH of the water is acidic (or less than 7.0), it must be corrected with a special type of neutralizer filter ahead of the iron filtration system. It is usually best to test for pH right at the water source, and not depend on laboratory analysis for pH, since in some cases the pH can raise after sampling, giving false results. Water softening is sometimes used to remove dissolved iron in low levels (less than 2.0 ppm), although more commonly, we use iron filters in conjunction with water softening if the water is both hard, and high in iron or manganese. Iron is generally not thought of as toxic, although there are some studies that show liver toxicity to men. Typical Chlorine Injection System with Pro-OX Iron Filter and Carbon Backwash Filter. Ultimate system removes iron, manganese, odor, kills iron bacteria. No chlorine residual in the house. No chlorine tastes or odors.